One year ago today, I started this blog – Spirit Of The Sikh – as a way to collect my thoughts, stories, and experiences. And perhaps along the way, some may come across it and offer their comments and ideas as well. Little did I know that so many friends, family, and “gur-siblings” all over the world would take an interest in my posts. For this, I am truly humbled. Spirit Of the Sikh has also opened up opportunities for me to write on other forums, all of which have given me a chance to expand my thinking, write more critically, and from time to time…take some criticism too. All of which, I am extremely grateful for. I’m very thankful for all you have who have commented on my posts , given feedback, challenged me, and motivated me – through comments on the blog, Facebook messages, and face-to-face conversations. As I look to the year ahead, aligning with my personal goals of doing more reading (literature, history & Bani) and less writing – my posts may become less frequent. You also may see less essays and more poetry (my first love). I’m also hoping to invite some guest bloggers to share their ideas to this audience as well. Although there are many sites, blogs, and discussion forums raising and defining issues affecting Sikhs today (which is refreshing), few of them connect these issues with a Sikh’s personal experience. Much can be learned from this, by readers and writers alike. In the year to come, I hope Spirit Of The Sikh can help facilitate such introspection…both individually and collectively. We of the Punjab, were called to don the robe of the Guru’s discipleship. We wear turbans as He did; we keep long hair as He kept. We prefer the colours he liked. We are still alive with the spark he lit in our souls. The torch when lighting another creates its own images. We carry the Guru’s face. His features, His whole image in our face and form. As I ponder who I am, I knew I am of the Guru. A few weeks back, while skimming through the news, I found an interesting report on Canadian Prime Minister Stephen Harper’s recent visit to the Darbar Sahib in Amritsar. Although I didn’t care much for the hoopla around his visit, I did find it interesting that he “offended” Sikhs by refusing to accept parshad or langar. As I understand it, the preparation of parshad (grace) is unique in that it is ceremonially touched by a kirpan (kirpan bhet), which serves as an indication of the Guru’s acceptance and blessing. It is then distributed to 5 Amritdhari Sikhs representing the Guru Khalsa Panth. A Sikhs’ consumption of parshad displays a submission to the Guru. So accepting parshad is essentially “accepting His grace.” I’ve also been taught that parshad should be distributed after the hukamnama is read, as accepting parshad symbolizes acceptance of the hukamnama. Now, whether or not Sikhs themselves understand the hukamnama, or even listen to it is another post for another day – but, if accepting parshad is accepting the Guru’s hukam, should a non-believer accept it? Although the Rehat Maryada states that parshad should be offered to everyone equally (as it should), should we be offended if someone rejects it? If a non-Sikh understands the meaning behind our practice and politely refuses it out of respect, shouldn’t we appreciate it instead? I remember years ago at a Sikh Day Parade in Washington DC, as a handful of us were walking through the sidewalks handing out “Who are the Sikhs” pamphlets and answering questions from onlookers, an elderly BibiJi was darting through the crowd distributing parshad to random strangers. As shocked as I was to see this, it couldn’t compare to the shock on the face of those who received it. Most were not sure what to do with it, or joked about it with their friends, while others were seen throwing it away. I’m sure the BibiJi’s heart was in the right place, but what were we hoping to accomplish by this? My question is…how can we value our traditions if we don’t even understand them? And if we don’t value our traditions, how can we expect others to? Unlike parshad, langar is prepared without such rituals. It is meant to be a “common kitchen” where everyone can participate regardless of beliefs. It is such a central part of our tradition to partake in langar, that I can understand why Sikh sentiments may have been hurt when Prime Minister Harper refused it. Perhaps his administration did not understand the origins behind it, or maybe his handlers in Punjab did not prepare him well enough. But if in fact he did understand the origins of langar and still refused it, then maybe Canadian Sikhs can begin a dialogue with the PM to understand why. Perhaps the Ontario-area Sikhs can invite him to the Gurdwara to “give him another chance.” Seems like a small price to pay for a politician who is clearly interested in the Sikh vote. Harper’s visit raises another question – do local Sikh communities have a published “Gurdwara Protocol” for non-Sikhs? Does the SGPC have such a document for foreign dignitaries visiting Gurdwaras of historical significance? When I’ve seen local politicians brought in to our own Gurwdara, they seem to be ushered in while committee members bark commands in to their ear on where they should bow and when they should stand. Often times they approach the podium not having a clue on who Sikhs are or what we’re all about. Perhaps one of the upcoming Sikh conferences could take on this “one-pager” for non-Sikhs outlining central tenets of our faith as well as basic protocol. Lastly, how far should we go to accommodate our guests? Essentially…how should we treat VIPs in a place where there is no such thing as a VIP? What if Prime Minister Harper preferred to wear his shoes during his visit? When does a visitor become unwelcome and how do we handle it? As our generation takes bigger strides to open the doors of the Gurdwara to non-Sikhs, these questions will become more relevant. Perhaps we need to be more proactive and find better ways to prepare visitors so their visit to the Gurdwara can be both a pleasant and educational experience. I’d love to hear your thoughts…or hear what more progressive sangats have already done. My introduction to Bhai Avtar Singh was in the late 1970’s. Okay, to be fair…I was only a toddler and my family was hosting a kirtan at our home in memory of my great-grandmother who had recently passed. Maybe it was only a coincidence that the famous ragis, Bhai Avtar Singh and Gurcharan Singh, sons of Bhai Jawala Singh and 11th generation kirtanis, were passing through Washington D.C. and were available for kirtan seva that morning. Perhaps it was only a coincidence that my great-grandmother herself enjoyed listening to their kirtan very much. And maybe it was also a coincidence that two of her own sons were in fact named…Avtar Singh and Gurcharan Singh. Coincidences aside, it was the beginning of a very special relationship. I can’t say I remember much from that kirtan, but my father did request Bhai Sahib to sing Ab ki baar baksh bande ko and the recording of that shabad has been etched in my childhood ever since. Two decades would pass before our paths would cross again. This time, through my friend’s CD player in his car soon after Gurmat Sangeet (1999) was released. Although I enjoyed listening to kirtan, personally, I preferred a more popular form of kirtan with a faster tempo. However, being that my friends were big fans of Bhai Avtar Singh and we listened to and sang kirtan together a lot, I was repeatedly exposed to Bhai Sahib’s reets (musical compositions)…and eventually, it grew on me. I particularly connected with Mero sundar kaho milay kith galli in Raag Devgandhari and Rattay ishq khudaae in Raag Asa. With some help, I also learned how to play the latter on the harmonium, by thumbing through Gurbani Sangeet Prachin Reet Ratnavali, a book authored by Bhai Avtar Singh and Bhai Gurcharan Singh, wherein they have transcribed hundreds of musical compositions that have been performed in their family for centuries. I was lucky that Bhai Sahib was well recorded. There was an abundance of tapes, CDs, and MP3s available of professionally-recorded as well as live kirtan. I compiled nearly a full collection of his work and listened to it at every opportunity I had. After spending years absorbed in his 31 Raagas (2001) CD, I had the great fortune to listen to Bhai Avtar Singh live as he was passing through Chicago on his 2003 North American tour. The first shabad I heard him sing live was Mohan neendh na aaveh in Raag Bilaval. A soon as he began the manglacharan, my eyes welled up. I’m not sure what it was. Perhaps it was the crackle in his voice that reminded me of a different era, or maybe I was feeling nostalgic of the recording I grew up with, or maybe it was the fact the shabad was sung in the same raag, feeling, and emotion in which my Guru wrote and sung it himself. Whatever it was…I was hooked. I had the opportunity to listen to Bhai Sahib and his jatha, which included his son Bhai Kultar Singh and nephew Bhai Swaran Singh on the jori, on their two subsequent trips to North America in 2005 and 2006. 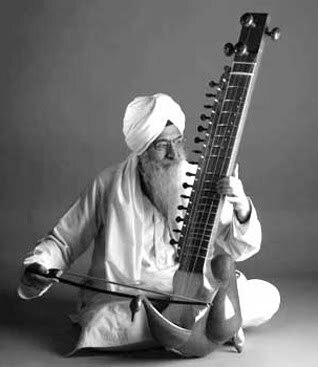 Bhai Avtar Singh’s last visit was most special to me in that in that I got to hear him perform kirtan while playing the Taus – a traditional string instrument he had not played for decades in favour of the more popular harmonium. It was breath-taking! Although I enjoyed listening to Bhai Sahib do kirtan at the Gurdwara during his visits, it was the private concerts at people’s homes during the week I enjoyed most. Often times I would arrive early before work, right as Asa Ki Vaar would start. In that intimate setting, early in the morning with only a few people present, the experience was magical. Especially with the tanti saaz (traditional instruments), all I would do is close my eyes, and I would feel as though I was in Guru Nanak’s darbar – with Bhai Mardana plucking the rabab and baani flowing through the Guru. I try not to put kirtanis and raagis on spiritual pedestals, but I do have tremendous respect for Bhai Avtar Singh for his 60 years of kirtan seva, his complete mastery of the art, and for preserving the tradition of Gurmat Sangeet. Although I have listened to all types, Bhai Avtar Singh’s style of kirtan, with all the love and emotion he expressed it in, is what I’ve connected with the most. It has exposed to me the world of gurmat sangeet, which has encouraged me to understand and reflect on baani rather than simply listening to it. All of which (with His Grace) will bring me closer to the Guru. I thank Bhai Avtar Singh for helping shape my Sikh experience and thank Waheguru for giving us this rare gem of a man for a wonderful 81 years.